Vitamin C is one of the few vitamins that is a household name across the nation. After all, no breakfast is complete without a tall, vitamin C rich glass of orange juice. But besides staving off scurvy and boosting your immune system, are there any other benefits to this seemingly overhyped vitamin? As it turns out, vitamin C can play an essential role in slowing the aging process of your skin and maintaining that youthful glow you have worked so hard to achieve. As we have talked about in previous blog posts, collagen is a protein that acts as the structural integrity of the skin which keeps it nice and tight and free of wrinkles. The more naturally produced collagen in your skin, the less fine lines you are likely to develop. This is where the magic (science) of vitamin C comes in. 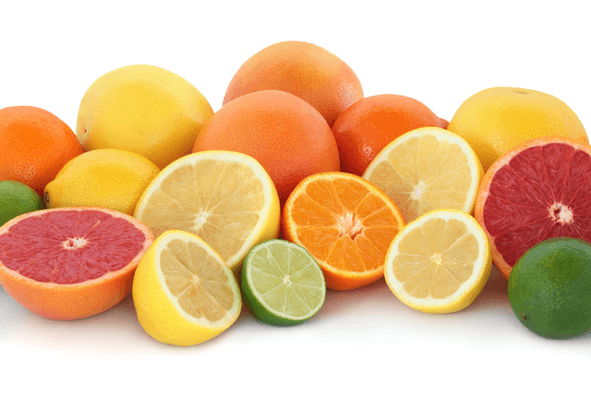 Vitamin C, or ascorbic acid, plays a vital role in the production of collagen in your body. When you use vitamin C the ascorbic acid assists the production of the protein collagen which then travels to certain areas of your body that need to be supported or repaired. Collagen not only keeps skin firm and plump, it also acts to repair blood vessels and plays a role in the growth of various cells. While promoting the production of collagen, vitamin C also aides in the creation of scar tissue as well as helping surface level skin abrasions heal themselves. Practically going down the checklist of past topics covered on this blog, vitamin C is also a powerful antioxidant that curbs the spreading damage caused by free radicals. Free radicals, if you don’t recall, are oxygenated particles in the air that are constantly hitting your skin on a day to day basis which rip electrons from atoms on your skin and cause a chain reaction of destruction that can leave you with anything from fine lines to dark spots. Antioxidants lend extra electrons to these negative-charge-hungry free radicals which effectively stops the string of damage that they started. So not only does vitamin C promote the protein that builds skin up, it also stops the pesky processes that break skin down. You can of course get your daily dosage of vitamin C from citrus and other various fruits but in terms of topical application of vitamin C, Lira Clinical is the best in the business. With amazing products such as the MYSTIQ Intense C15 Booster, BIO Hydra C Serum, and the PRO C4, Lira has a wide array of vitamin C infused skin care products. Try any of these incredibly effective lines of products today and find out for yourself the age-defying effects of vitamin C!